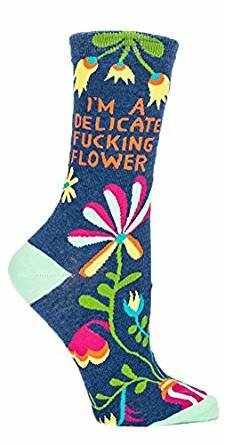 The cool thing about these socks - other than the fact that they are pretty and comfy and strong as hell - is that you can put the emphasis wherever you want. Women's shoe size 5-10. 53% combed cotton; 45% nylon; 1% spandex. 53% combed cotton; 45% nylon; 1% spandex. If you have any questions about this product by Blue Q, contact us by completing and submitting the form below. If you are looking for a specif part number, please include it with your message.